How to Protect Your Trees from the Summer Heat | Mr. Tree, Inc.
Each year homeowners spend time, energy, and money to develop and maintain a lush landscape around their homes. For most, this involves caring for a variety of trees as they contribute to more than just curb appeal. Trees add quality to the environment and provide important benefits to your property such as shade, fruit, and nuts, and protection from wind. But as the seasons change, it’s important to keep in mind that your trees also need a little help from you to stay healthy through more extreme weather. The summer sun has just arrived, so start planning how best to keep your trees healthy through the long, hot months. There are a number of dangers trees face during the summer—dehydration, lack of nutrition, and pest infestations to name a few—but there are also a number of simple strategies you can use to nurture your trees through this time. Watering regularly, using mulch, appropriate fertilization, and knowing the when and how of residential tree trimming will keep your trees growing strong year-round. Layering mulch around the base of your trees helps retain moisture. This is especially important for young trees whose root systems are still close to the surface. Spread the mulch in a two to three-foot-diameter circle around the tree. Leave a space between the mulch and the bark of the tree; this will prevent moisture buildup and rotting and keep insects attracted by the mulch away from the tree itself. Ideally, the mulch should be about two inches deep. Before you lay the mulch, it’s important to water the tree and to continue watering throughout the summer. 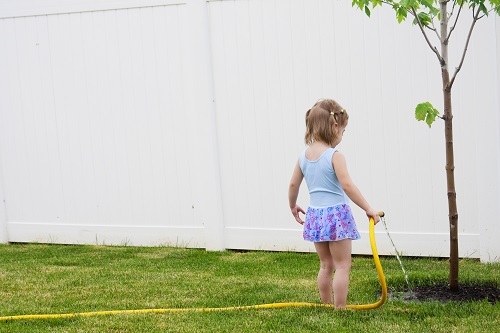 Although watering your tree sounds pretty straightforward, there are some things to remember to make sure you provide the most benefits possible during the summer heat. Water trees slowly to prevent overwatering. This will allow trees to better absorb the water you provide. A drip or sprinkler system is a good way to ensure a consistent, slow application. Avoid watering during the hottest part of the day or when the sun is at its highest. Water evaporates quickly during the warmest hours and this could deprive your trees of vital moisture. Watering during evenings or early mornings is best. Make sure the ground around each tree is thoroughly irrigated during every watering. You need to provide enough moisture to keep your trees hydrated until the next time you water. But remember not to overwater—adding more than a tree will be able to absorb can cause root rot. Water trees on a consistent basis. For some trees, this might mean daily, while others might need as little as once a week. Weather can also play a part in your watering schedule. Extreme heat can cause quick evaporation, which can shorten the time needed between watering, so adjust your schedule according to the temperature and humidity. If it happens to rain, grab a cup of tea and enjoy letting Mother Nature take care of this chore for you. Using fertilizer adds essential nutrients to the soil and the healthier the soil, the healthier the tree. As you’d expect, healthy trees withstand summer heat and drought better than those that lack important nutrients. Knowing when to add fertilizer and what type of fertilizer to use takes some research and practice, but you too can become an expert. Depending on the age and type of tree you’re caring for, you may need to vary the nutritional balance of the fertilizer you choose and how often it’s applied. For example, a tree that thrives in more acidic soil will require a fertilizer with higher acidity. This involves using a fertilizer with the right balance of nutrients. Avoid fertilizing older fruit-bearing trees too much as it could affect the harvest. Also, some trees will benefit most when fertilized before the hot weather months begin, while others will benefit from regular applications of soluble fertilizer throughout the summer. And you can always fertilize again in the fall if the summer has been especially hard on your trees. It might be helpful to discuss best fertilizing practices with a local tree expert or a local garden center. Pruning is a necessary part of caring for the trees on your property. But is summer the best time to do this? Good residential tree trimming requires both skill and knowledge. During the hottest months, it’s best to only remove dead, diseased, or damaged branches. You want to remove anything that might be dangerous during a storm or high winds. When you do prune during the summer, be sure to follow up with extra fertilizer and water so the tree remains healthy. And always remember to use safety measures when trimming your trees. Pruning trees at the wrong time or in the wrong way can cause unnecessary damage and stress for your trees, so don’t take a chance and guess. If you’re wondering whether to trim or if you’d like to hand the job over to a professional to ensure the best quality, contact our experienced residential tree trimming team at Mr. Tree. Maintaining a healthy tree-scape doesn’t mean giving up the enjoyment of summer to unending yardwork. It only takes a few easy steps to care for your trees—mulch, water, fertilizer, and pruning—and it’s worth it. Not only will these efforts save you energy and money in the future, but bringing your trees through the hot summer healthy and strong will mean a longer life for them and years of beauty and benefits for you and your home.